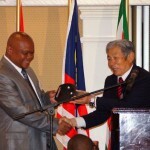 Sapesi and the Free State Department of Education organised a hand-over ceremony in Bloemfontein. In 2014, the Free State Department of Education will, with this reinforcement, have a fleet of 11 buses including one stand-by vehicle for emergencies. 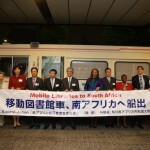 On June 29, the car-carrier “Sunshine Ace” of our shipping Partner MOL, arrived in Durban, transporting 6 Mobile Library units, namely 3 for Mpumalanga DoE, each one for Free State and Gauteng DoEs, and the East Rand NGO Ekufundzeni. These buses were delivered safely to these destinations after custom clearance. 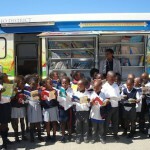 Most of the Mobile Libraries in the Free State are now providing a service to 40 schools per bus, covering 362 schools, which is a third of all their schools without libraries. The majority of the books required for the Mobile Libraries are children’s books – in their mother tongue and in English. The more schools the buses visit, the more books are required in order to rotate the stock between the schools.